Carcinoma of the breast is the most common female cancer worldwide with an estimated 1.67 million new cases diagnosed in 2012 and age-standardized incidence rates ranging from as high as 96/100,000 to as low as 26.8/100,000. Apart from socioeconomic factors that negatively impact on outcome, especially in developing countries, the College of American Pathologists has classified prognostic factors of the disease into: Category I: Factors proven to be of prognostic importance and useful in clinical patient management. These include TNM stage and histologic grade among others; Category II: Includes factors such as c-erbB-2 (Her2-neu) and lymphatic invasion; and Category III: All other factors of insufficient prognostic value, such as DNA ploidy analysis. The histologic tumor grade is also called the Nottingham grading system (NGS). In this system, the 3 features graded include tubule formation, nuclear pleomorphism, and mitotic index; each rated from 1 to 3. The final NGS score ranges between minimum score of 3 and maximum score of 9 and are divided into three grades: Grade 1, score 3–5, well differentiated; Grade 2, score 6–7, moderately differentiated; and Grade 3, score 8–9, poorly differentiated. In a large-scale study, Rakha et al. found that Nottingham histologic grade is an independent predictor of survival. The implication of this to clinical practice is the need to ensure accuracy and reproducibility of grading by periodic auditing and training of personnel. Slides of 73 cases of primary invasive carcinomas of the breast diagnosed between January, 2015, and December, 2016, were retrieved from archives. These were randomly grouped into 43 cases on which consensus Nottingham grades (1, 2, or 3) assigned by 3 pathologists were compared with initial grades assigned to the cases. The next 24 cases were graded independently by 4 pathologists and compared. In the last 6 cases, consensus grades were assigned to both the initial core needle biopsy (CNB) and the excisional biopsy. Kappa values were calculated for each group. The three Nottingham components, including tubule (gland) formation, nuclear pleomorphism, and mitotic count, were graded as described by Elston et al. Leading edges of tumors were chosen for assessment of mitosis, and these were counted in 10 high-power fields (hpf) using a field diameter of 0.44 mm. Mitosis was considered positive if the cell had no nuclear membrane and had condensed chromosome either clotted (late prophase to prometaphase) in a plane (metaphase/anaphase) or in separate clots (telophase). Scores were allocated as shown in [Table 1]. Kappa values were scored as: <0 (poor reproducibility); 0.01–0.20 (slight reproducibility); 0.21–0.40 (fair reproducibility); 0.41–0.60 (moderate reproducibility); 0.61–0.80 (substantial reproducibility); and 0.81–0.99 (almost perfect reproducibility). Kappa value (κ) for the first 43 audited cases was 0.50 (moderate agreement; P < 0.05). Of these, 13 (30%) were upgraded from the initial assigned grade while 2 (5%) were downgraded. The upgraded cases comprised 6 cases upgraded from 1 to 2 and 7 cases upgraded from 2 to 3. A case each was downgraded from 2 to 1 and from 3 to 2. There was only fair agreement (κ = 0.25) between the CNB grade and final surgical pathology grade, with 50% being upgraded from Grades 2–3. No case was downgraded. There was moderate agreement (κ = 0.53; P < 0.05) in the 24 cases on which inter-rater agreement was tested. Category-specific rating of both mitotic index and nuclear pleomorphism showed fair agreement (κ = 0.25 and 0.34, respectively) while rating of tubule formation showed moderate agreement (κ = 0.57; P < 0.05). Pairwise kappa agreement ranged from fair to good (0.31–0.63). The kappa (κ) values ranging from 0.25 to 0.57 found in this study for inter-rater agreement on histologic grading of invasive breast cancer cases, 0.28–0.83 reported by Meyer et al., 0.5–0.7 reported by Longacre et al., and 0.53 reported in a study  that involved 23 pathologists from 12 European countries are pointers to the high degree of variability associated with the NGS. Yet, as documented from studies, this grading system has correlated well with prognosis in breast cancer patients. The degree of interobserver agreement in any classification or grading scheme appears to be a function of the complexity of the scheme. In the histologic grading of breast cancers where as many as three different parameters are to be evaluated, each on a scale of 1–3, the possibilities are further multiplied. Reproducibility may further be plagued by the absence of objective parameters to be employed in scoring a histologic continuum. This may explain the low agreement consistently documented for nuclear pleomorphism as reported in this study (κ = 0.34) that by Meyer et al. (κ = 0.37–0.50) and 0.07–0.54 reported by Mora et al. While in the latter study, it was found that variability in nuclear grading was not influenced significantly by years of experience, others  have found greater reproducibility of nuclear grading by breast specialists versus nonspecialists. Even though others , have described a greater degree of inter-rater agreement in mitotic index grading (κ = 0.45 and 0.39, respectively), the fair agreement (κ = 0.25) recorded in our study is similar to that described in a Chinese study  (κ = 0.28). To improve agreement in the assessment of mitotic activity, several authors have proposed myriad of modifications to currently employed parameters. Meyer et al. proposed reducing the mitotic index to 0–2, 3–10, and >10 mitotic figures per ten 0.18 mm 2 hpf, having found this to better predict outcome in patients followed for 6.4 years. Increasing the number of fields counted to between 20 and 30 was another suggestion, and they found to have correlated better with prognosis. Bonert and Tate  suggested standardization of the microscope field area and recommended the use of larger field areas (0.40 mm vs. 0.69 mm), having found this to be more reproducible. Al-Janabi et al., on the other hand, have recommended whole-slide digital imaging as a panacea to the problem. This was based on the observation that comparable grading was found when this technique was compared with microscopic grading. Concordance of 50% between CNB and surgical pathology in our study is lower than 69% documented by Zheng et al. while upgrading in 50% of our cases is higher than 24%–40% described by others.,, These differences may be due to fewer cores being submitted by our surgeons as well as interobserver variations based on pathologist's experience. No case was downgraded in our study compared to 7% reported by Zheng et al. In the index study, underscoring of mitotic count contributed significantly to underscoring of the overall grade, and this has been corroborated by other studies. Even though breast cancers are heterogeneous, mitosis is usually most active at the growing edges of tumors [Figure 1], and this can better be appreciated on surgical pathology when the entire tumor is excised than on CNB. Based on these observations, greater clinical attention should be paid to adequate sampling, especially from tumor edges. In addition, greater clinical weight should be placed on higher grades (3) assigned to CNB than the lower grades (1 < 2). The overall moderate interobserver agreement in this study applying the NGS (κ = 0.54) is similar to that described in other studies (κ = 0.43–0.83) [Table 2], including the largest study conducted in Nottingham which involved 600 raters (κ = 0.45).,,,, That most of these studies fall in the range of moderate-to-good attests to the resilience of the NGS as a clinically useful grading system. However, several modifications have been proposed, including the evidence-based suggestion by Meyer et al. for omission of nuclear grading which others have also found to be least reproducible. Frequent auditing and retraining of pathologists may be the panacea to inter-rater disagreement. Effect of strict adherence to guidelines has also been shown by the Nottingham study as a way to improving reproducibility of the NGS (κ = 0.45 to κ = 0.53). Fitzgibbons PL, Page DL, Weaver D, Thor AD, Allred DC, Clark GM, et al. Prognostic factors in breast cancer. College of American Pathologists consensus statement 1999. Arch Pathol Lab Med 2000;124:966-78. Arul P, Masilamani S. Comparative evaluation of various cytomorphological grading systems in breast carcinoma. Indian J Med Paediatr Oncol 2016;37:79-84. Elston CW, Ellis IO, Pinder SE. Pathological prognostic factors in breast cancer. Crit Rev Oncol Hematol 1999;31:209-23.
van Diest PJ, Baak JP, Matze-Cok P, Wisse-Brekelmans EC, van Galen CM, Kurver PH, et al. Reproducibility of mitosis counting in 2,469 breast cancer specimens: Results from the multicenter morphometric mammary carcinoma project. Hum Pathol 1992;23:603-7. Sloane JP, Amendoeira I, Apostolikas N, Bellocq JP, Bianchi S, Boecker W, et al. Consistency achieved by 23 European pathologists from 12 countries in diagnosing breast disease and reporting prognostic features of carcinomas. European commission working group on breast screening pathology. Virchows Arch 1999;434:3-10. Mora B, Bombari D, Schaefer SC, Schmidt M, Delaloye JF, Mast F, et al. Tumor architecture exerts no bias on nuclear grading in breast cancer diagnosis. Virchows Arch 2012;461:399-403. Dunne B, Going JJ. Scoring nuclear pleomorphism in breast cancer. 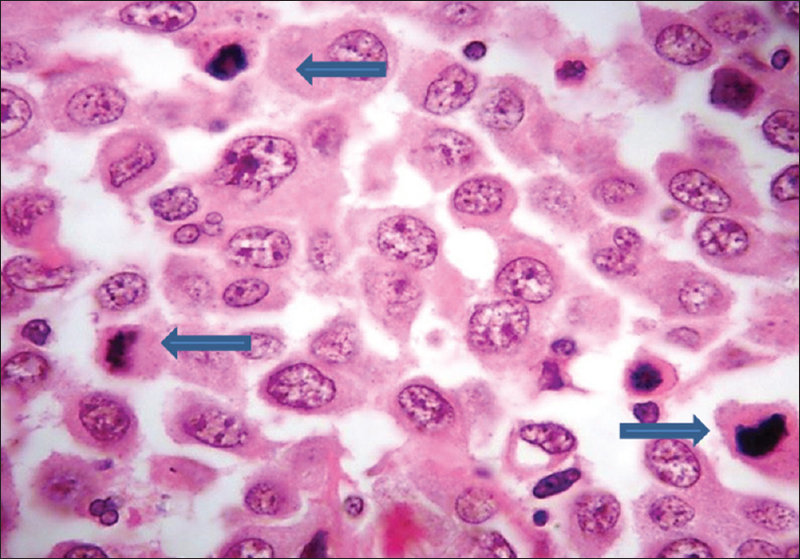 Histopathology 2001;39:259-65. Jacquemier J, Charpin C. Reproducibility of histoprognostic grades of invasive breast cancer. Ann Pathol 1998;18:385-90. Zheng J, Alsaadi T, Blaichman J, Xie X, Omeroglu A, Meterissian S, et al. Invasive ductal carcinoma of the breast: Correlation between tumor grade determined by ultrasound-guided core biopsy and surgical pathology. AJR Am J Roentgenol 2013;200:W71-4. Denley H, Pinder SE, Elston CW, Lee AH, Ellis IO. Preoperative assessment of prognostic factors in breast cancer. J Clin Pathol 2001;54:20-4. Rakha EA, Ellis IO. An overview of assessment of prognostic and predictive factors in breast cancer needle core biopsy specimens. J Clin Pathol 2007;60:1300-6. Badoual C, Maruani A, Ghorra C, Lebas P, Avigdor S, Michenet P, et al. Pathological prognostic factors of invasive breast carcinoma in ultrasound-guided large core biopsies-correlation with subsequent surgical excisions. Breast 2005;14:22-7. Anderson TJ, Alexander FE, Lamb J, Smith A, Forrest AP. Pathology characteristics that optimize outcome prediction of a breast screening trial. Br J Cancer 2000;83:487-92.